This nonprofit hosts three clinics and two mobile dental clinics offering a variety of services to the community with no appointment necessary. The trick is to get the word out, so residents can get the health help they need. 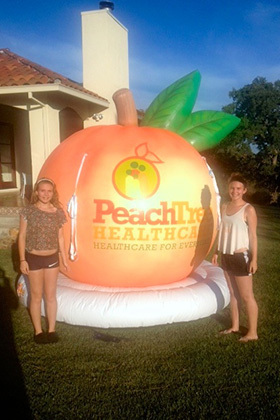 Greg Stone, Chief Executive Officer, explains, "Our giant peach is brand new to us and will help us gain name recognition in our community at health fairs, county fairs, farm markets, school events and almost any event we take it to." In addition to the inflatable logo, Peach Tree also plans to stack squeeze balls shaped like fruits and veggies around the base of the balloon. Each ball will have their logo, contact info and messages related to developing healthy habits. How did Peach Tree find out about Landmark Creations? A referral from an air ambulance company for which we created a 2/3-size scale helicopter several years ago. Good news travels fast! Looking for more creative health care inflatables? Visit our online galleries!